Hillary Clinton speaks in Las Vegas. Last week, FiveThirtyEight’s Nate Silver explained why the National Popular Vote Interstate Compact, a plan to circumvent the Electoral College in favor of the national popular vote, isn’t likely to work. We’re probably stuck with the Electoral College. Democratic partisans might not be too displeased by that. 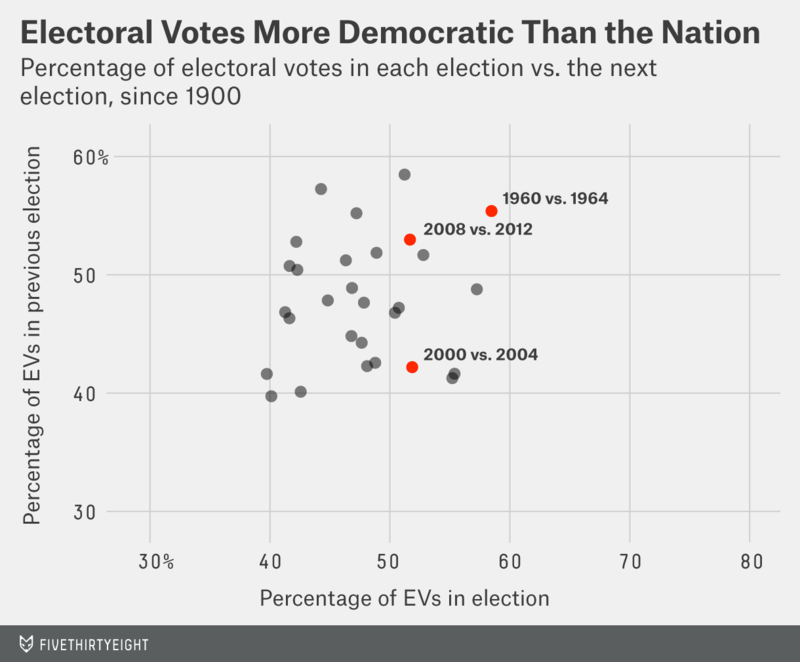 After all, Democrats have overperformed in the Electoral College relative to the popular vote in the past two elections. But here’s the thing: The Electoral College advantage has swung back and forth. I found this out by gathering presidential election data since 1900. For each year, I looked at the margin between the major parties in each state, compared it with the national margin, and calculated how many electoral votes were more Democratic or Republican than the nation as a whole. During the first half of the 20th century, Republicans benefited greatly from the Electoral College. They could have lost the national popular vote and won the electoral college in 12 of the 13 elections from 1900 to 1948. On average, they could have lost by 2.2 percentage points nationally and emerged victorious. A large part of the GOP’s advantage was caused by the Democratic vote’s concentration in the South. Democratic candidates were racking up huge margins in the region, but a candidate gets the same number of electoral votes whether he wins a state by 50 percent or 1 percent. The election in 1928 was the only one in which a majority of electoral votes leaned more Democratic than the nation. That was partially because the Democrats nominated Al Smith, a Catholic, at a time when many Southerners were prejudiced against Catholics. Since 1952, the Electoral College picture has changed. Beginning in that year, Republicans began making inroads into the South. Democratic votes became more dispersed, and the Republican advantage in the Electoral College waned. Today, the South is solidly red, but Democrats still win over 35 percent of the vote there. That’s a far cry from pre-1952, when Republican candidates sometimes didn’t break 10 percent of the vote. From 1952 to 2012, the majority of electoral votes leaned more Republican than the nation seven times and more Democratic nine times. But in the past five elections, Democrats appear to have opened up a bit of an edge. They could have won the Electoral College while losing the popular vote four of five times. Still, in that streak was 2000, when Republicans won the Electoral College without winning the popular vote. Indeed, knowing how many electoral votes leaned more toward one party than the nation in one election tells us very little about how many will lean toward that party in the next election. An Electoral College advantage is often taken as a sign of a structural advantage, but for the most part, it’s been cyclical. The Democratic edge in 2008 and 2012 may be more due to randomness than demographics. Candidates, campaign strategies and luck matter. In 2016, a Hillary Clinton map may look very different from a Barack Obama map. Clinton has traditionally polled better in Appalachia than Obama but worse in the West. A map in which the Republican Party is increasingly reliant on the white vote may put it in better shape in the Midwest, while one in which the party tries to wins elections by appealing to Latinos may put it in better shape in the South and Southwest. Democrats might have an Electoral College advantage in 2016, but they shouldn’t count on it just because they had an edge in 2012.